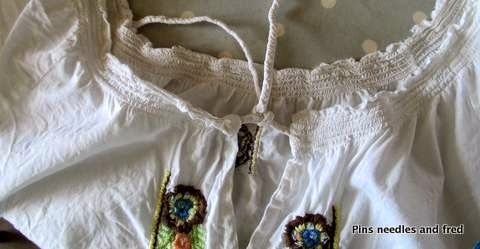 I love gypsy tops, especially during the summer, they are so pretty. 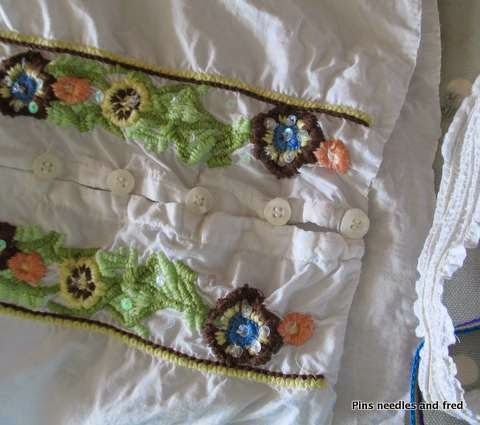 I found this one in need of some attention in a charity shop; it has lovely embroidery and rouleau loops around pretty pearlised white buttons at the front. 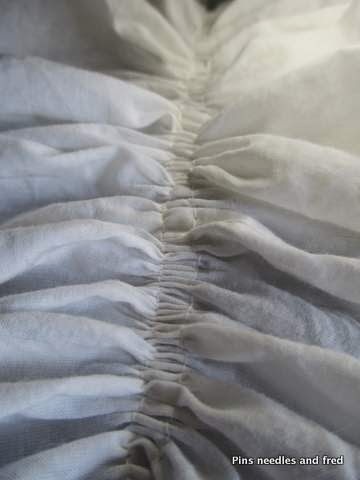 However the elastic smocking had gone at the top and round the bottom, but with a little work the pretty top could be re-vamped. For some reason the tops this year have been rather unflattering and it sometimes makes me wonder, firstly why all tops have to be a particular design and why they make clothing that distorts the figure adding pounds. The industry knows that we are four basic shapes and this particular style only suits apples. 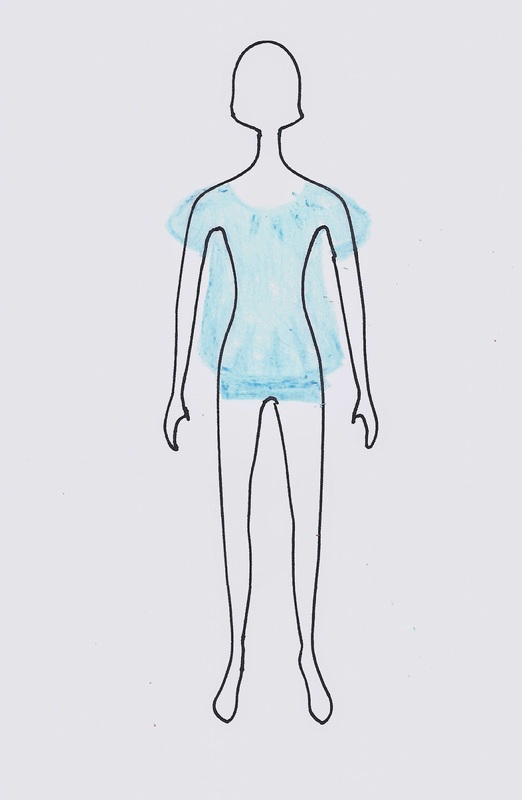 As you can see from my sketch, the top is gathered around the hips, the widest part of the body – because it is loose around the waistline and goes in at the hips – it would swamp nearly everyone, dropping right down from the bust at the front. This style would only suit those who have a bit of a tummy to hide under all that gathered hipline, the rest of us would look overweight. The plan is to cut off the gathered edge at the bottom and create a gathered waistband, this brings the top back in to accentuate the smallest part of a woman. 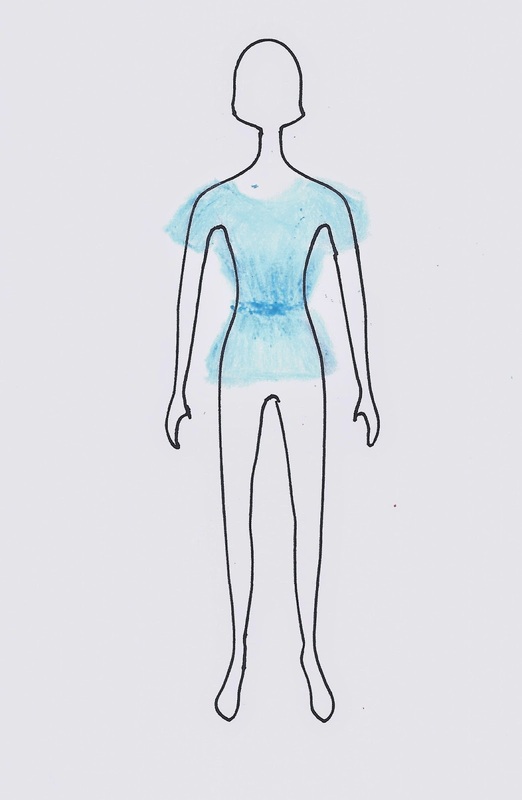 By drawing attention to the waist, you can look slimmer instantly! I cut off the bottom band of gathering and used the overlocker’s rolled hem to create a pretty finish. 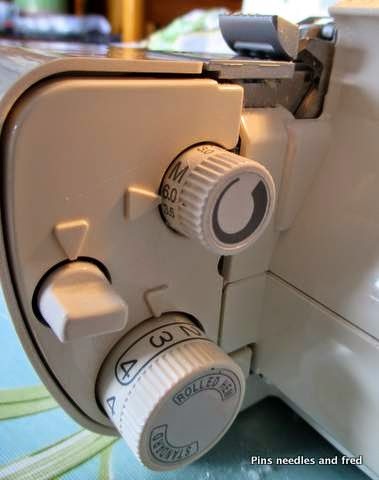 The bottom button should be removed as it cannot go under the overlocker foot. Not only does an overlocker give a more professional finish to a garment, but the pretty rolled seam would lighten the edge of this top allowing it to ripple gently down from the waist. 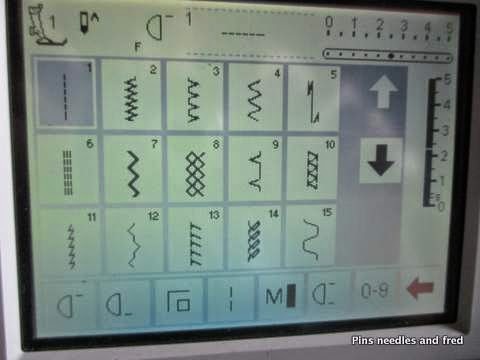 If you don’t have an overlocker, you can use the scallop edge stitch in most machines (see * below)- it looks like a zig zag stitch that has been flattened off at the peaks. 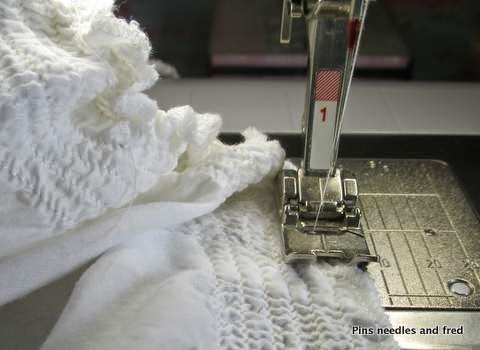 Elasticated smocking is very easy to do on a sewing machine, you simply wind the bobbin with elastic rather than thread. 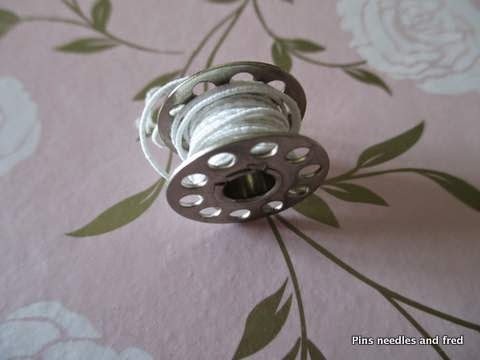 Take care that you slightly stretch the elastic when you wind the bobbin and when you put it in the case. It comes out from the bottom of the stitch plate and is slightly thicker than thread so you might have to adjust your lower tension. 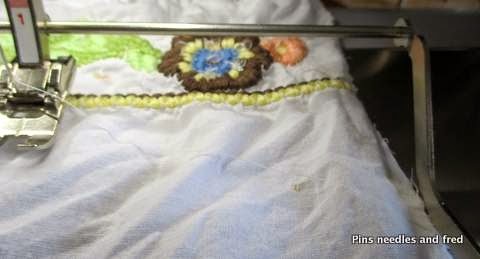 The key with any smocking is to space the rows of stitching evenly. I use the foot as a guide: you can see that my fabric is lined up with the inside edge of my foot. Slowly stitch round the top; gently stretching it as you go, so that it will gather. You will notice the fabric behind the foot will be gathered, keep working round the edge until you reach the other end. 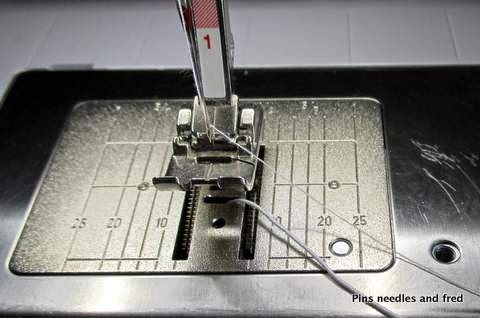 Use the stitch plate guides to continue working rows of stitching until you have your desired depth of smocking. I have roughly calculated that my waistline needs to be about 10cm from my bottom edge. You can either measure up and mark all round the waistline with air drying pen, but I am fortunate to have an additional guide that slots into the foot. Stitch around the top slowly working the fabric through until you have reached the beginning. The second row of gathering has been done using the edge of the foot as a guide to keep the stitching lines parallel. 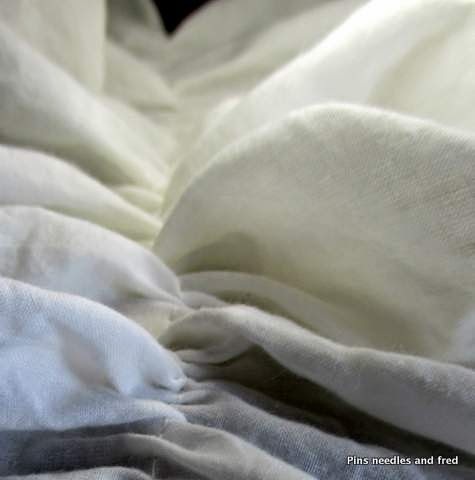 Pull the fabric this time so that it is not gathered when it reaches the footplate, otherwise your gathering will double up, ending up with a very small waist! You can stitch as many gathered rows as you like to create a broader waistband. As you can see from the picture, the top edge has returned to its nicely stretched edge but I also have a gathered waistline that shows off my curves!